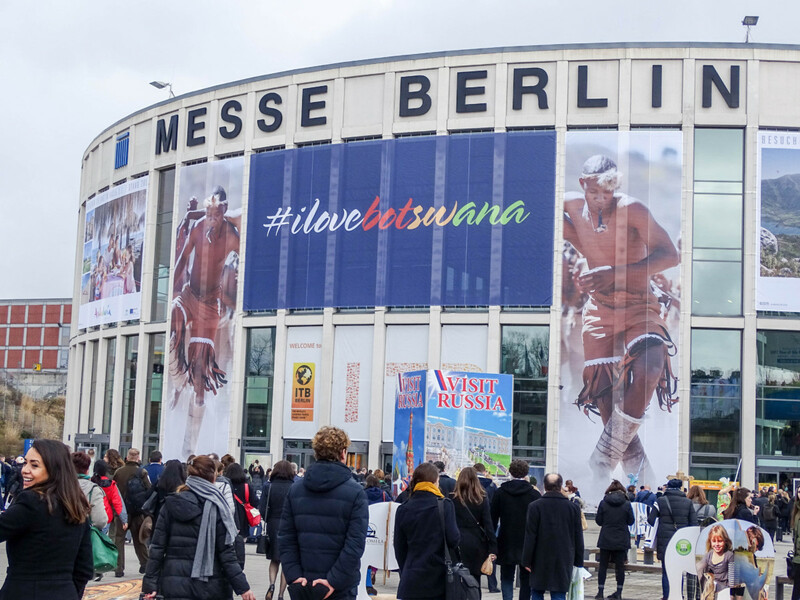 Presumably the biggest travel trade show in the world, The ITB Berlin took place from 8-12 March in Berlin. Being known for mainly leisure industry, there is also a MICE niche emerging. SITE Germany event took place on Monday, the ITB Berlin MICE Day on Tuesday and several destinations had their representatives from the Convention Bureau to take meetings. Additionally, I met colleagues from the MICE industry. Is there a new trend emerging, where leisure and MICE merge into one trade show? Before I come back to this question, let me tell you more about my experience in Berlin and ITB. I travelled by train from Heidelberg to Berlin with Deutsche Bahn. I travelled on Tuesday 7 March in the morning, one day before the event so I didn’t expect the train to be busy, therefore didn’t reserve a seat, and indeed it wasn’t necessary. If you know that you’ll travel during peak hours, especially from Thursday onward reservation would be recommend. What I didn’t know and discovered only too late, was that the ITB has a partnership with Deutsche Bahn. Anyone who is travelling to the show and can show a valid show ticket gets reduced ticket price for the journey. When I checked one day before the show, the difference was 20 Euros from what I paid. Well, next time. On the way back, on Thursday the 9th, I left the exhibition at 2.30pm and to catch my 3.01pm train. This time I decided to try the LOCOMORE train, a private railway provider and a “startup” that raised money through crowdfunding campaign. They operate on long distance routes from Stuttgart to Berlin. They run their first train between Berlin and Stuttgart on 14 December 2016. At the moment they have limited operations and run only once a day and not all days. For example I couldn’t book them on Tuesday. A major advantage was that I didn’t need to change. I booked the business class for 58 Euro and it was excellent. Again was last minute, so maybe you can get better rates if you plan ahead. You get a six cabin for three people and served two drinks and a snack, friendly services as well. Also my hotel I booked last minute and by this time hotel rates in Berlin were very high. All my online search attempts for a “reasonable hotel price” were fruitless. I must add that I looked for a central accommodation to have short distance from evening events. I also checked for Airbnb, but the prices for what it seemed to be on the picture weren’t convincing either. Almost desperate by this point, I asked a family friend who’s teenage daughter went to Berlin few times and whether she can recommend me a hostel. She did, the Heart of Gold Hostel in Central Berlin. The hostel is just two S- Bahn stations from the main train station and 35 minutes from the Berlin Messe, I couldn’t be happier! With no frills, I got a single room with shower but no toilet, but since I barely spent time in the room, I didn’t mind. It was clean and central, and the price was OK so I wouldn’t mind staying there again during the ITB. Nevertheless, you can still expect paying higher hotel rates than usual, though at least you’ll have a bigger choice. Otherwise Berlin is not an expensive city. Pre ITB Berlin, SITE Germany held an event for members and non-members at the Museum of Communications, followed by dinner at an Italian restaurant La Via del Muro. It was an informal event and I didn’t know anyone, but quickly we became friends and engaged in interesting discussions. What I love about the events industry is that no matter how far you are, being surrounded by #eventprofs you’ll feel at home immediately. The restaurant was very lovely, and I really enjoyed this evening. The ITB Berlin MICE Day was organised by the German Event Planners Association (Vereinigung Deutscher Veranstaltungsorganisatoren e.V.). It was a full day of presentations ranging from inspiring talks to more practical sessions. The German Event Planners Association is the leading association in Germany with over 600 members and represents the voice of the industry, host education sessions at major industry events and leads the industry in Germany with innovation and research. First session I attended was about digitalising booking processes. Given by the CEO of the Association Bernd Fritzges, he discussed that the booking process hasn’t changed much in many years and the challenges planners are facing with venues when trying to book online, for example, slow response times. On the other hand, venues also face challenges. Venues receive one booking request over multiple channels and need to treat all requests equally. That in turn slows the response time. Today there are over 100 booking portals, and the question remaining is how suppliers can cope with it. If you understand German, I highly recommend viewing the full session here. Afterwards, I listed to the session from Raul Krauthausen about event accessibility. He is a very prominent German disability rights activist and with his multiple projects he addresses social issues about diversity. In his very powerful presentation he gave practical solutions for barrier free events. He founded the ramp-up.me platform where event planners can inform themselves how to plan accessible events. The topics encompass three areas: Event location, programme and communication. On the website he gives exact guidelines what to consider with each of the three areas. For example, for event location consider the venue, doors, stage, ramps, lifts, high tables, chairs for longer standing periods. Secondly for programme, are your speakers bringing both cultural and gender diversity to your event programme? And lastly, communication. Consider technical equipment, translation, signal interpreters, train your staff and speakers overcome reservations and how to avoid blunders when interacting with people with different abilities and many more very practical tips. Last session was from Miha Kovačič, CEO at the Slovenian Convention Bureau and Gorazd Čad, CEO at Toleranca Marketing. They presented the Slovenian methodology for creating memorable events. Just one month earlier my colleague Joanna Axinte went to the Conventa in Ljubljana and experienced the methodology by herself. You can read about her experience here, and view the full presentation from ITB Berlin here. In the afternoon, I attended a press conference at Atout France stand about Welcome City Lab and France Tourism Lab. Welcome City Lab is a programme aimed at stimulating innovation within tourism in Paris established in 2013. France Tourisme Lab is a network of French incubators and accelerators positioned on tourism. Created in December 2016, it already features around ten structures offering support to startups that have been operating for different periods of time, including Welcome City Lab. It was very insightful presentation about the emerging tech scene in France and its economic importance. Since 2013 it has achieved multiple milestones. These include, among others, 70 startups in incubator, provision of four services: incubation, academy, experimentation and economic intelligence, 70 Million Euro raise and +400 jobs created. You can read full session summary here. In the evening I attended an event organised by Switzerland Tourism at their Embassy in Berlin. The event had a theme, “The Nature Wants you back”. This is also the latest summer campaign launched by Switzerland Tourism. With this campaign, the aim of Switzerland Tourism is to promote the entire Alpine region for summer, increase brand awareness “Switzerland” and promote its authenticity and sustainability in Summer, provide tips for summer holidays and extend the summer season and lastly, strengthen the industry in Switzerland with sustainable tourism. The event took place outdoors with welcome speech from Christine Schraner Burgener, Swiss Ambassador in Berlin, and Jürg Schmid, director of Switzerland Tourism. Afterwards we were treated for a traditional Swiss Raclette. The following day at the show was very short. I attended only for few hours, had spontaneous meetings and at 2.00pm headed back to catch my train to return to Hiedelberg. Now let’s get back to the initial question – do we start seeing that MICE and leisure are merging and exhibitors are responding to this trend? Yes. In an industry where face to face communication plays a major role, buyers can’t wait until next industry show dedicated to MICE, there must be other events where to meet buyers. There are many boutique trade events emerging and attracting small amount of hosted buyers. But ITB is not a Hosted Buyer event. Its scale and proximity to important German market makes it an attractive business hub for both buyers and suppliers. No other show can compare with the scale of ITB Berlin. It’s a major opportunity for suppliers to come close to their target audience and always stay in people’s minds.